Earlier this month, we have teased the signing of a new player on Twitter, leaving many of you guessing about who we have picked up. Today, we are really excited to reveal our expansion to FIFA esports, as we join forces with the top German talent Oguzhan “oguzhan” Metin! The 22-year-old talent has already made a name for himself in the FIFA scene by qualifying for the FIFA FUT Champions Cup in Barcelona after he managed to win 156 out 160 matches during the qualification phase. He has also placed 22nd in the official FIFA world ranking – which is a formidable achievement on its own. Fans might have also seen Oguzhan compete in the German Championship, where he qualified for the “Virtuelle Bundesliga” playoffs in Düsseldorf, Germany. FIFA is one of the fastest growing and most successful sports games in the world, with millions of players worldwide enjoying the game on a regular basis. Famous sports clubs such as Manchester City, AS Roma, Paris St. Germain & Schalke 04 already have players competing for thousands of dollars. It makes us incredibly happy to know that we will have Oguzhan and his world-class talent in the game representing us in FIFA. First of all, I’m very glad that I have signed for BIG. The conversations went well from the very first moment and I immediately had the feeling that I’m in the right place. Furthermore, it was always important for me to play for a club or clan from Berlin. I want to represent Berlin as good as I am able to and I think together with BIG we have a good chance of achieving it! 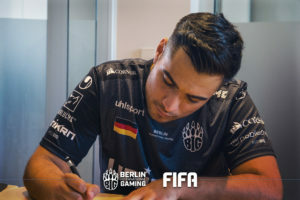 After having had an eye on FIFA for several months now, we’re proud to join forces with one of Germany’s greatest talents. Oguzhan Metin’s outstanding capabilities, his passion for the game and dedication make him a perfect fit for our organization, as he meets the core values a professional athlete is supposed to have. FIFA is one of the most successful sports games for decades now and its development as of late is tremendous. We’re happy to be part of this adventure together with Oguzhan Metin. Welcome to BIG!